To my remarks about young people finding the Traditional Mass attractive, a commenter going by the name 'T-C' made a comment which I think deserves a wider audience. As a young person myself, I just wanted to add something of my own personal experience. Among those who are young that attend mass, not everyone has the same perspective. The ones who are willing to talk about the state of the mass in their parish, school, or University are usually the ones who are also traditional minded. They only see an issue in the first place because they have to some degree felt the influence of traditional Catholicism (or have an appreciation for tradition / culture in general). The sad truth is that this is a very small amount of young people. Now there is an equally small minority that is activist like and does want to deliberately party up the mass and to use it like some social event. They have internal agendas just as the masons or other groups did. Although they are small, the undecided majority usually finds their suggestions more attractive than that of the traditional ones. After all, when we are young, there is this naive mindset that "new = what we must have", "change = good" etc. So in practice, this is why it is so hard for the traditional minded young folks to change things. Most priests are aware that they exist. From my own personal experience, voicing concern does not help. Eventually you become the villain who is portrayed as the pharisees trying to stop the "innovative" ways for bringing in "converts". Most of the fellow neutral peers lap up that portrayal as well because they think we are fussing too much over something like the mass or faith in general. At the end of the day, the neutral amount of church goers among the young make up a large chunk. It is easier for a priest to sell them the idea that the mass is a social gathering/banquet than the traditional one which requires some effort to appreciate. It is also easier for them to see the trad youth as pharisaic or troublemakers who make those who follow the attractive trends in campuses feel like they are wrong. 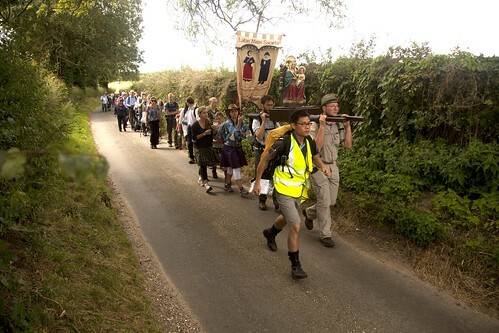 Traditional Mass, you'd better not look at photos of the Chartres Pilgrimage. I agree with this, it makes sense, but as a not-so-terribly old person myself, in contact all the time with people younger than me, I'd like to add a few things of my own. In a typical school 6-Form group, or in a typical bunch of Catholics arriving at a typical university, the number of young Catholics who have had experience of, or have begun to take an interest in, the Traditional Mass, is zero. But then the same is true of the more evangelical liturgical options, or indeed of anything non-standard. Taize chant, prayer groups, meditation, whether New Age or actually Catholic, our young people are innocent of all these things. They've been dragged along to Mass a few times, and they get the standard parish liturgy, which almost everywhere is not terribly experimental, whether in a traditional or in a hip-hop way. This isn't entirely a bad thing: constant experimentation in the liturgy is itself destructive of liturgical formation and parish life. So outside a few unusual settings, or where you are dealing with a really large group, a lobby for the Traditional Mass among young people does not exist, indeed lobbies for different kinds of liturgy or devotions don't exist, until the options are in some way presented to them. They are also ignorant about the Faith. One parish priest told me recently of an experience he'd had of a group of Catholic children in a posh non-Catholic secondary school, whom he was attempting to prepare for Confirmation. He asked them what the resurrection was. There was a baffled silence, and then one of them asked if it was something to do with reincarnation. When these young Catholics turn up in a non-parish setting, whether it be a school with an active chaplain or university or something like Youth 2000, then the organisers have a free hand in deciding what to do. The young people in their charge will tend to have an open mind. It is at this point that you have little groups of zealous evangelical or charismatic young Catholic forming, from the generous souls among the young who have been told that this is Catholicism, and this is how to get in touch with God. It is an undeniable fact, however, that this kind of thing is also powerfully off-putting to a lot of young Catholics. If you tell them all that this is what religion is all about, you will be putting a good number of them off religion. The classic scenario is to tell them religion is all about getting in touch with your feelings and sharing these with others, perhaps in a touchy-feely prayer-group where you are supposed to ask the group to pray about your problems. When that happens you can say goodbye to about 90% of the adolescent males, and you may never see them again. And families: at the SCT Family Retreat. The question, to repeat, is not what the young people are explicitly asking for, since they don't, usually, know what the options are. The question is what they make of what they are offered. Some will like the evangelically, charismatically, groove, though I do wonder what happens to them when they feel they are getting a bit old for it. This problem isn't limited to the Catholic experience: if Holy Trinity Brompton is full of under-30s, and has been for 30 years, what's happens to them when they reach 30? At least a proportion of them lapse with a life-long inoculation again Christianity, which they regard as juvenile, anti-intellectual, and embarrassing, a phase in their lives they'd rather not talk about. Do young people respond to the Traditional Mass and traditional devotions? A good number of them do. These are available in such a limited number of places that it is impossible to make a scientific appraisal, but for many young people the experience of the Traditional liturgy is a life-changing revelation. They may grow out of it, a few certainly move on, but what we don't need to worry about is it being a fad fuelled by dubious religious emotion. It appeals to the heart, through the music and ceremonies, it appeals to the intellect, through the texts and the theology, but above all it is all about the public prayer of the Church and the Sacraments. 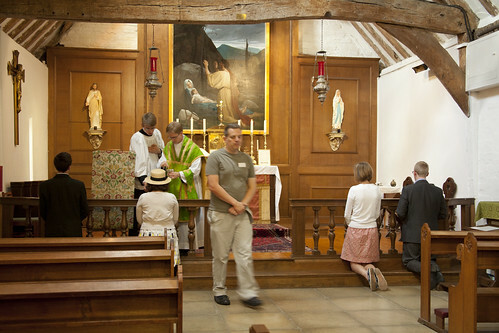 My experience of talking to the young people who came to our Mass in the Slipper Chapel at Walsingham, a young lady and a man, who said that it was a huge relief after the Youth 2000 experience, mirrors conversations I have had with masses of young people, and their pastors, over the years. To repeat the obvious, very few Catholics under 40 have even heard of the Traditional Mass: it is a completely closed book to them. For many, nevertheless, when they stumble across it, it is exactly what they have been looking for. For others, it answers questions, historical and spiritual, they have been asking for a long time. Others find in it, after a bit of getting used to it, an approach to spirituality which is uniquely satisfying. Such, of course, was my own personal experience as well. 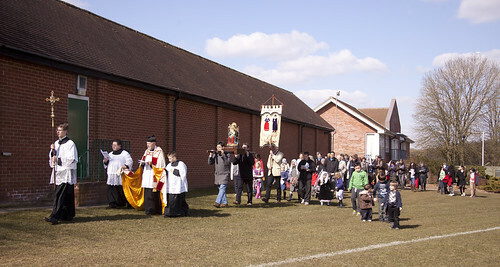 One of two EF Low Masses celebrated at the Evangelium Conference last time I was there. Each morning. ... it has clearly been demonstrated that young persons too have discovered this liturgical form, felt its attraction and found in it a form of encounter with the Mystery of the Most Holy Eucharist, particularly suited to them. This is the other one. The demographics are our most important and powerful resource. At New Rite events, such as Youth 2000, the female to male ratio is very high. At Old Rite events, such as the YCA retreat, conversely, the female to male ratio tends to be very low. Much has been said about the "femininity" of the Novus Ordo, as opposed to the "masculinity" of the Vetus Ordo. I don't think that the stereotyping of male and female spiritualities should be omitted in your deliberations, rather to remind people that the constant teaching of the Church has been that male and female are different. Female being at their core more nurturing (read touchy-feely or emotional and tangible). It is natural that they find satiation in the New Rite youth events. As you and T-C pointed out, the problem is a massive lack of Catechesis coming from the people in positions of power - the PP, the Bishop, the Pope etc. How often do you hear from the pulpit that "we should strive to remember that the Fathers of the Church have always pointed out that the emotional is juvenile and immature, and that spiritual growth is away from the emotional and tangible, through the intellectual, to the mystical and intangible." My experience of young women at Traditional youth events (as compared to those attending New Rite youth events), is that they tend to be much more "mature" in their faith and as people. While my experience of young men at vaguely-Charismatic youth events (in comparison to their Traditional counterparts), is that they are much more immature in their faith and as people, and that their motivation for being at such events, in truth, has much more to do with the young women that are there, rather than getting to know, love and serve God more. No youth event is entirely free from that motive, of course, but it seems remarkably more apparent at New Rite youth events. But to conclude, I would add to T-C's and your remarks, that the solution to the problem is Authority, Bishops attending Traditional youth events and instructing their Dioceses to support and encourage young people to attend them. Bishops to start diocesan-wide catechesis based on Traditional Patrimony rather than the newer touchy-feely washed-down stuff. Bishops? Bishop, one Bishop, to start with. Someone willing to stand up against the status quo, put his head above the parapet, someone like Bishop Athanasius Schneider. Although we have disagreed in the past (without rancour I hope) here I must agree. Recently in the diocese of Hexham & Newcastle 3 young people (in their 20s) have formed a Chapter of Juventutem & are taking over the roles of Local Representatives of the LMS when Theresa & I stand down in December. Their journey hasn't been easy due to some suggestions that Juventutem should not proclaim its closeness to the LMS but they pressed on & have been rewarded. They have so many great ideas one of which, Eucharistic Adoration, is already in place. My message to those who raised the objections is to be positive & pray for the success these young people so richly deserve. As a somewhat old person, who has probably seen if not all, then most of it, may I state the obvious. The Church is in a bad way. The Relativist Reformation at present has the bit between its teeth. 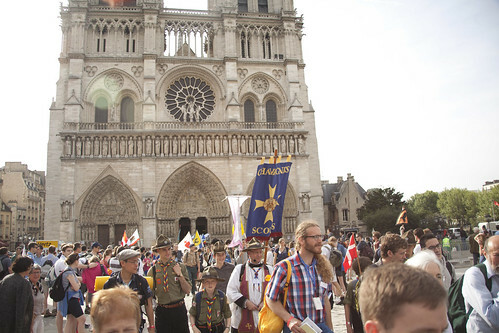 Young Mass goers are small fraction of the total, and Catholics in Continuity among them, are a tiny fraction of that. Perhaps 2% of the total of “nominal” Catholics”? And that’s optimistic! As Benedict XVI said, we may have to accept a smaller Church for some time. Sadly, we can effectively forget most of the currently ageing serving clergy. USA figures show the average of priests to be 64 which means in say 10 years, it will be 74. I’m not good at arithmetic but that suggests when my youngest grandchild is say 25, she will find a Catholic priest very hard to track down indeed. The small but growing Traditional orders, and that small number of other priests interested in the Mass of Ages, in 20 or 30 years, will be substantial percentage of a still declining Catholic clergy – and that is where the revival will start. After all, you young Catholics, what percentage were the Apostles? Completely agree with everything you have said Dr. Shaw! I also agree with catholicscout's post above. I think if we had many Bishops like Bishop Athanasius Schneider, the situation would improve drastically. My current diocese and the Catholic Universities in it, in contrast, are very hostile to tradition. Also in that regard, at least many of friends who just entered seminary have a very positive attitude toward the traditional mass and the other traditions of the Church. So if that survives through seminary, the future does look brighter. But given the nature of the seminary education and those involved in it, that is still a challenge for them as well. Dr. Shaw - I think it is good that you have highlighted this comment from T-C- and responded to it. I write to note that, in a limited way, our demographic experience at Juventutem Michigan is different from the demographic experience that catholicscout has observed: As a general rule, our monthly Juventutem gatherings are attended by equal numbers of young men and young women. Within our territory (and, sometimes, further afield), Juventutem Michigan is constantly working to newly introduce the Traditional Latin Mass to young adults who have never attended it before. A Juventutem Michigan gathering isn't a celebration of those who already identify as traditionalist (which, yes, among young adults would tend mainly to be a narrow selection of males) but a celebration of Catholics who are praying to God in a beautiful way (which can be anybody and which tends to be half men and half women). In 30 months, we've rotated through something like 30 different parishes, for our monthly Sung Masses (click here and then click "past events"), and have met lots of wonderful people along the way. As our picture albums show (e.g. 1, 2, 3), there is no reason to think that only young men will check out the Traditional Latin Mass, if the invitation is equally extended. Michael Davies: ten years today. Pray for him.